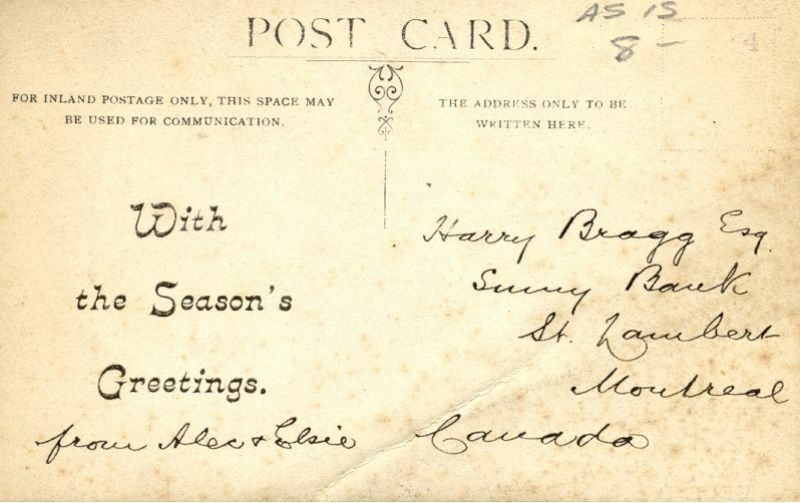 This much-travelled postcard was commissioned circa 1905 by Alexander Wisely Bragg and his wide Ellen Sarah (Elsie) Bragg, apparently to send as a Christmas Card to the friends and relations from their new home, 'Belthorn', 43 Davenport Park Road. Sent to Alexander's brother Harry in Canada, it somehow found its way to England to be traded a century later. No stamp has survived: perhaps the card was enclosed with a letter. Alexander Wisely Bragg was born in Blackburn, Lancashire, in 1848, the son of John Bragg, textile manufacturer and his wife Anne Wisely Bragg (née Unwin). Anne was born in 1847 in the village of Belthorn, Lancashire where her father the Reverend John Harding Unwin was Minister of the Congregational Church. It was common practice in those days for the wife to choose the name of a new house, as she clearly did in in this case. Indeed she was the legal owner of the house; this was often arranged to ensure that the widow would not lose the house on the death of the husband under old-fashioned rules of inheritance. Mr Bragg had qualified as a Chartered Accountant, and practised in Blackburn, before re-locating to Stockport by the time of the 1891 census which records the couple at 120 Northgate Road, Edgeley. They had no children, but living with them at that time was a 75-year-old Welsh-born blind lady, Mary Davies. Northgate Road is lined with small Victorian houses, suggesting they were not especially prosperous at that time. In 1901 the couple, now on their own, were at 61 Bloom Street, Edgeley. 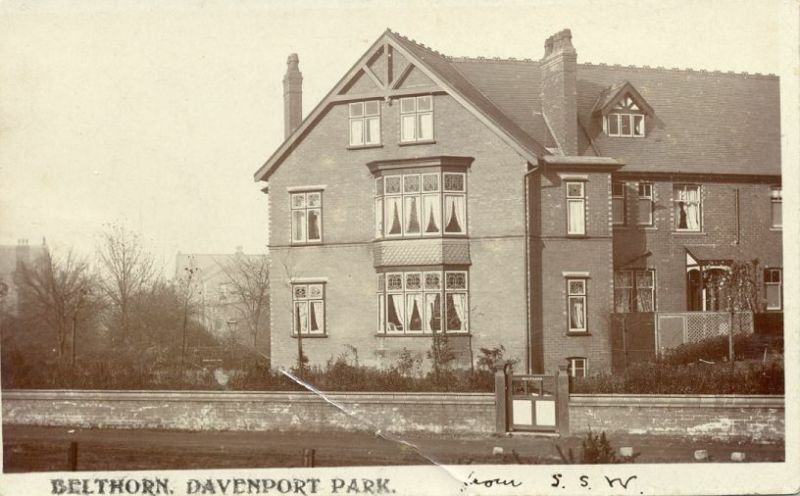 The business must have eventually been successful (or perhaps they inherited some money) as a few years later in 1905 they were able to purchase this large (12 rooms plus bathroom and scullery) newly-built house in the Davenport Park private estate. The 1911 census shows that they could afford a live-in general servant. 33-year-old Emily Lewis, born near Wellington, Shropshire. In 1913 Alexander would have been 65 years old, and it appears he decided to retire. The 1912-13 electoral register, the last one before World War I, lists him at 'Belthorn' but then the couple vanish from British records. Fortunately we know what happened next, thanks to the on-line records of the Protestant Cemetery in Rome, which include a photograph of their grave. 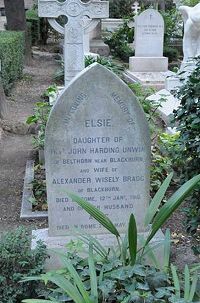 Ellen Sarah Bragg died in Rome on 12 January 1916; her husband also died in Rome, in May 1928, at the Calvary British Hospital in Via San Stefano Rotondo, Rome, an institution founded by a British Nun to care for British visitors. The next householder of No. 43 was Richard John Daniell, born in Cornwall in 1858. In 1891 he was a schoolmaster, living in in Truro, Cornwall with his wife Marion (née Smith) and son Percy Smith Daniell. The 1911 census records him as a widower, living in Truro, Cornwall, and a Sub-inspector of Schools; later that year he married Alice Mary Michell in Truro. By 1914 they were living at 'Belthorn': presumably he was transferred to Stockport by his Civil Service employers, perhaps as a promotion to the higher grade of Inspector. By 1920 his son Percy Smith Daniell, who had served as a officer in the Royal Engineers during World War I, had joined them at 'Belthorn'. By 1925 the family had moved south to Surrey, where Percy married in 1926. Richard and Alice lived at 'Uplands', Rosebery Road, Cheam, Surrey; he died there in 1936 and his second wife Alice Mary Daniell died in January 1940. Charles Stanley Grundy, Mus. B. (Dunelm), L.R.A.M. was born in Manchester in 1881 and married Florence Eliza Rogers in 1908. He was a 'musician, teacher of piano and singing' and organist at Albion Congregational Church, Ashton-under-Lyne. They stayed in Davenport for many years, at least until the onset of World War II. In the 1930s the electoral registers include other residents, Margaret Bearpark and Helena Dorothy Baugh, which we assume were boarders rather than servants. Dr. Rupert Sykes, the next head of the household at No.43, was born in 1907 in Lockwood, Huddersfield, a son of a wealthy Woollen manufacturer. He obtained a B.Sc in Chemistry, then trained in medicine in Manchester and held junior appointments at Manchester Royal Infirmary and Ancoats Hospital. In the 1930s, he had a surgery in Albert Square, Manchester and his name appears as medical expert for the Police in newspaper reports of a number of murder cases in the Manchester area. He lived in, and served as Warden of, Lister House, at that time a hostel for medical students in Nelson Street, near the Infirmary. In 1940 he married a nurse, Joan Leigh Bennett, daughter of Mr and Mrs T. Bennett of 'Moorgarth', Mile End Lane, Stockport, at Trinity Church, and soon afterwards they moved in to No.43. He was a Major in the Royal Army Medical Corps from 1942 to 1946, serving in England, North-West Europe, and Africa, where he gained experience of tropical diseases. The 1945 electoral register, the first after the War, shows Joan living in No.43. After demobilisation, he returned to Manchester and was honorary physician to Manchester Northern Hospital and Oldham Royal Infirmary. He was later appointed consultant physician to Stockport Infirmary and Stepping Hill Hospital. In the 1950s his surgery was at 11 John Street, Manchester. His spare-time activities included climbing in the Peak District, and playing piano and bassoon with the Stockport Symphony Orchestra. Dr Sykes gave up the post at Stepping Hill in 1974, and about that time the couple moved to a bungalow in Bramhall. He continued to work with patients at the artificial limb fitting centre, Withington Hospital until 1987 when - aged 80,- he retired to spend more time with his family, in his garden and on the golf course. Joan Sykes died in 1997. In 2007 Dr Sykes became something of a local celebrity when he celebrated his 100th birthday with 50 members of his family, including four sons, seven grandchildren and seven great-grandchildren - some of whom flew from Tasmania for the occasion. The house still thrives in 2015, secluded behind hedges within the Davenport Park Conservation Area. 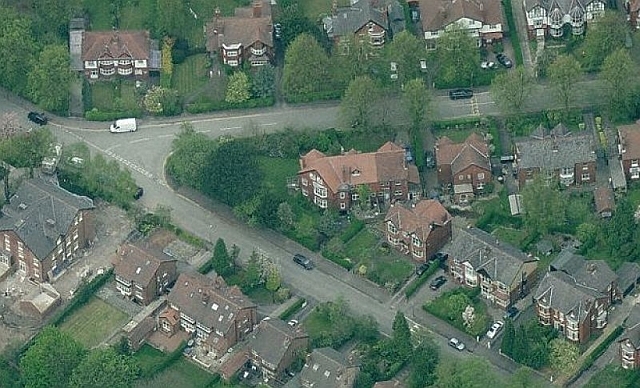 The aerial view - from Bing Maps - explains how its unusual shape relates to the street layout and a covenant which required all houses in the Park to be set back 12 yards from the road. No 43 is in fact a semi-detached property with No. 41, although this is not immediately evident from the postcard view. The reason for the high hedges is clear: the house does not enjoy the usual privacy offered by a rear garden. The map extracts above show Davenport Park in maps dated 1898 and 1910 with 'Belthorn' maked in organge on the latter. The area was, until 1877, owned by the Davenports of Bramhall Hall, and had for many years been part of Mile End Farm, the farmhouse being near what became the junction of Davenport Park Road and the Manchester - Buxton road in the top corner of the extracts. The Davenports had been selling parcels of land in the area since the railway had cut across it in 1857, and John William Handley Davenport, the last of the family to live at Bramall Hall, determined to sell off all the remainder and leave away from the area. Early in 1877, in advance of the sale of the remainder of the estate to the Freeholders' Company of Manchester later that year, Mile End farmhouse, and the area which became Davenport Park was sold, for £5,500 by John William Handley Davenport to to a John Simpson of Stockport, who is listed in an 1878 directory at Mile End, although he is not listed in the 1881 census. The Land Registry documents, and a plan which accompanied the indenture, reveal that the land came complete with a layout of the streets, and an obligation to maintain the streets and build only houses approved by the Davenport family, although there is no evidence that any houses has been built at that time. The plan, which can be viewed on the Davenport Park website, includes some streets which were never completed. 'Stanley Road' would have run across from Kennerley Grove Lane (now Kennerley Road) to Clifton Road, and turned back to meet the far end of Clifton Road. Station Road was to connect Devonshire Road direct the station, and a short street called Egerton Road from part-way along Devonshire Road (later Devonshire Park Road) towards the railway. Perhaps there was an intention to make a railway crossing and meet the existing Egerton Road at The Crescent on the other side; if so, this ambition was never achieved. There did exist an underpass originally provided by the railway to allow the movement of stock between the two parts of Mile End Farm, but this vanished in the course of housing developments on both sides. In the early days, individually-designed were mostly built around the perimeter of the Park, as shown in the 1898 plan, leaving the 'Centre plot, with its greenery, its fine avenue of noble trees, and its grassy banks ablaze in the springtime with broom and gorse [was] a very pleasant and agreeable feature of the Park' in the words of a 1916 report which looked back at 20 years of the Park. It would seem that this central area was originally intended to remain as parkland. However, this did not last. It would appear that John Simpson may have been unable to repay a loan used to buy the land, as it was the the Union Bank of Manchester which in 1899 sold the land including the site of 'Belthorn' to William George Ward and Edwin Forbes Ward, Stockport hat manufacturers who at the time were investing in a considerable portfolio of land in the area. In 1903, the Wards leased a plot of land at a perpetual yearly rent charge of £54.0s.0d to a local builder, Arthur Boon, who built 'Belthorn' and its neighbours, to a very spacious design, on the former parkland. The Braggs' share of this annual ground rent was £7.10s.0d. Although mostly standard in general layout (apart from 'Belthorn') care was taken by the builder to include varying details in the houses such as the patterns of the decorative half-timbering of the gables. The 1979 designation leaflet on the Conservation Area refers to the pair of houses 41/43 Davenport Park Road as of particular interest, as 'key historic buildings'. Arthur Boon's houses were built to last, and today command high prices: No.43 changed hands in 2006 for £500,000.